I’m committed to switching from a Mac to a PC, and the next step is to start shopping. When you haven’t used anything but Macs for close to two decades, the sheer quantity and variety of Windows choices poses a challenge. So, while I researched which new Windows laptop would be a good fit for me, I spent some time experimenting with the first Windows computer I could get my hands on: my Mac. Most modern Apple computers come with Boot Camp Assistant—a program designed to help you turn your Apple computer into a machine that can dual-boot into Windows. A copy of Windows 10 Home can be had for $120 (or downloaded and used for free with limited options,) so using the OS with Boot Camp is a great way to see what Microsoft has to offer before you invest in a PC. Unfortunately, my beef with Apple includes several unresolved hardware issues. As such, I wanted a fresh start with a new computer. Running Windows on your Mac is a relatively inexpensive way to take a new OS for a spin. My PC needs are demanding. I travel constantly, so I have to have a laptop. As a journalist, my world revolves around typing, web research, and editing photos or video. Some of my work takes me into challenging environments, so solid build quality is important. I also miss gaming on my PS4 console, something I had to give up for my nomadic lifestyle. With all of this in mind, I decided to take the plunge with a Microsoft Surface Book. There are good reasons why it’s considered the pinnacle of Windows laptops. It has a high-resolution 13.3-inch display, a tough magnesium case, 512GB of storage (necessary for when I can’t access the cloud,) an Intel Core i7 mobile processor, 16GB of RAM, and a discrete graphics card that’s awesome for gaming. It also has a detachable display that I can use as a tablet. Icing on the cake: I can use Microsoft’s Surface Pen (the counterpart to Apple’s Pencil for its iPads) for noodling with Adobe Lightroom. The Surface Book is considered the pinnacle of Windows laptops for good reason. It’s a configuration that costs a lot of money, but it does exactly what I need it to do, and it replaces several different devices—my iPad, my dearly departed gaming console, and my MacBook Pro. This might be more computer than you need, or maybe you want something with even more processing power. I can’t shop for you, but as a recent Apple escapee, I can give you some basic advice on what to consider before dropping any cash on new hardware. Finding a computer which, at the very least, can cut the same mustard as your current Mac is an absolute must. Let’s start with the basics: What do you currently use your Apple computer for? What would like your new Windows computer to do? Adding the items from your wish-list that you can afford makes the transition from one platform to the other more attractive. If you’re an artist or deal with a ton of PDFs, perhaps a touch display or one that’ll work with a Wacom pen, is the way to go. Do you want your new computer to function as a tablet for reading in bed? There’s no shortage of touch-enabled Windows laptops that fold in half or come apart so you can use them as a tablet. Or skip this feature and stick with your iPad—but it must be said, having touch and pen capabilities on a full-fledged PC is something notably missing from Mac OS that you might welcome in Windows. You’ll want to consider the downside of any of the features that you want, too. Laptops with touch-sensitive displays typically demand more battery power than traditional models, for instance. If you want to do some gaming, work with CAD software or video editing, grab a computer with a Core i7 processor. My Surface Book uses the 6th-generation (Skylake) Core i7-6600U, a dual-core mobile processor, but newer laptops are rocking 7th-generation Kaby Lake CPUs that offer a bit more performance and efficiency. If your needs include lighter gaming, editing photos, word processing and web surfing, go with a less expensive Core i5, or if price is an issue, a Core i3 (although you’ll take a hit in processing power by doing so). You’ll find sluggish performance but better battery life with Intel Atom chips. Intel Celeron? Faster than an Atom CPU, but they get lousy battery life. Then there’s Intel Core M (also found in the MacBook 2016), low-powered chips that offer decent performance, but can’t touch the oomph you’ll get from a Core i5 or i7 chip. Ugh. Learning about this stuff is like falling down a rabbit hole, and best case, it reminds you that Windows PCs are updated far more often than Macs are. If you can, ask a PC-savvy pal for help (I did). Otherwise, PCWorld’s Best Laptops feature can give you an informative overview plus our top recommendations. When it comes to RAM and drive space, I’ll give you the same advice I give all my friends: Buy as much as you can afford. The more RAM you have, the faster your system will run while performing day-to-day tasks, especially if you run multiple programs or like to stack up a lot of browser tabs. Storage? More programs, more movies, more music—more everything. We live in an age where much of our media is streamed now, but having the space to keep important files ready at a moment’s notice without a wireless connection is nothing but win. 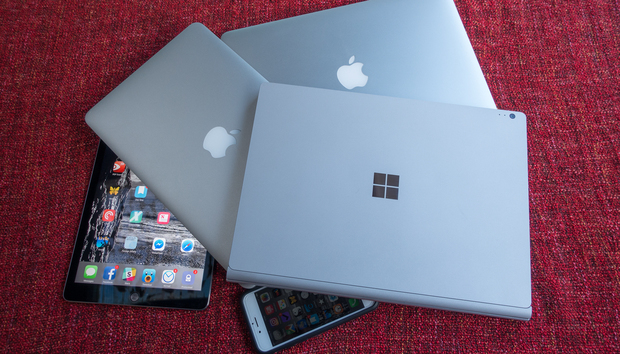 Windows laptops come in 11-, 12-, 13-, and 15-inch display sizes, the same as Apple does. But you’ll also find 10-inch models out there. A 17-inch display is common, too. Heck, Acer’s Predator 21 X offers a curved 21-inch display. If you’re using your computer for photo editing, gaming, design, or if you do a lot of multitasking, you’ll likely want a larger display. There’s also display resolution to consider. Happily, even el-cheapo box-store specials typically come with 1080p displays, what we’d consider the baseline. If you have the cash, you’ll find laptops with 4K/UHD displays baked into them, too. My advice is to ignore the hype and trust your eyes. If you edit 4K video for a living, going with an ultra-high-resolution display is a no-brainer. But if you’re just looking to watch iTunes movies, surf the web or video chat, chances are you’ll be happier with a less expensive option. Keep in mind that the larger the display, the more battery life it will demand. A larger display means a larger chassis, too—that means more weight to carry when you travel and less room in your bag. Find the balance that works for you. As for the graphics processor, all laptops grapple with controlling heat in ever-thinner cases. Most Windows laptops come with integrated graphics chips that provide adequate or better performance, with varying thermal loads. Mac users who are deep into first-person shooters or demand cutting-edge graphics have traditionally had to turn to gaming consoles or high-end Macs with Retina displays. A Windows laptop with a dedicated graphics card would feed the same need, but this feature can have a dramatic effect on your computer’s weight, battery life and price. If you’re a casual gamer who finds joy in playing older games like Civilization V or just want to be able to watch movies, a laptop with integrated graphics will cost you less money and should still prove satisfying. How your computer looks and feels is as important as what’s inside of it. The internal specs of any computer you buy won’t matter to you if you hate using it. Before you buy anything, go to a store and spend some time typing on it. Use the trackpad extensively. Listen to the speakers. Make sure it has the ports you want and that they’re positioned in a way that makes them easy for you to use. Consider the advantages of brick-and-mortar stores: You can walk away with the laptop you want with no shipping costs, and possibly easier return policies if you change your mind. If you decide to buy online, check the return policy closely. At any retailer, watch out for restocking fees. A new laptop is a significant purchase. You deserve to be happy with it. Next time we’ll talk about finding replacements for some of your favorite MacOS software.